2017 offer prices are £325 per week in April and October, and our normal price is £375 per week May – September inclusive. Our second visit. 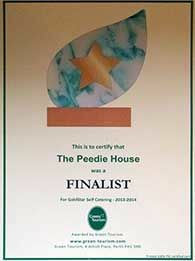 Enjoyed the views out to Copinsay and the quiet seclusion of the Peedie House. With Steve, Sarah & Sami around to offer tips and advice on wildlife watching in the islands, we really made the most of our stay in Orkney. Lisa Hooper and Alan Wake, Port William, Galloway. We had a really good time here - travelling all over the islands, seeing the birds, seals, waves, tombs, standing stones. Have some of Steve & Sarah's beef - it's the best beef you'll taste!